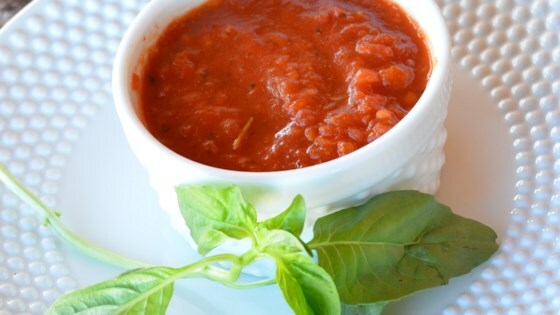 "The only marinara you'll ever need! Serve with your favorite pasta." Heat olive oil in a saucepan over medium heat; cook and stir onion and garlic until fragrant, about 2 minutes. Add mushrooms, red bell pepper, and parsley; cook and stir until mushrooms are slightly softened, about 2 minutes. Add oregano, sugar, basil, rosemary, sage, red pepper flakes, salt, and black pepper; stir to combine, 2 minutes. Stir tomato sauce into seasoned onion-mushroom mixture; cook over low heat until flavors have combined, 30 minutes. Transfer half the sauce to a blender; blend until smooth. Return to saucepan with the remaining sauce; stir to combine. This marinara sauce was amazing.Spicy and sweet.I have never had a better one anywhere.